A couple of leaked images online hints the launch of Yu Yureka Note in India. The images of the leaked retail box of the device claim the price to be Rs. 14,999 and list out the specifications of the device. According to the specs listed on the images of the retail box, Yu Yureka Note will feature a 6-inch full-HD IPS display (of 1080×1920 pixels resolution) with Gorilla Glass 3 protection. The phone is said to be powered by a 64-bit octa-core processor clocked at 1.5GHz and come with 3GB of RAM and Mali GPU. It will come with 16GB of in-built storage, which can be expanded up to 32 GB via microSD card. In terms of camera, the images hint that the handset features a 13MP rear unit and an 8MP front shooter. It will run Android 5.1 Lollipop out-of-the-box, will feature a fingerprint sensor, and will offer 4G connectivity as well as dual SIM functionality. There is no information on Cyanogen OS version. The unit pictured is the Black color variant, and it is not known if other color variants are available. 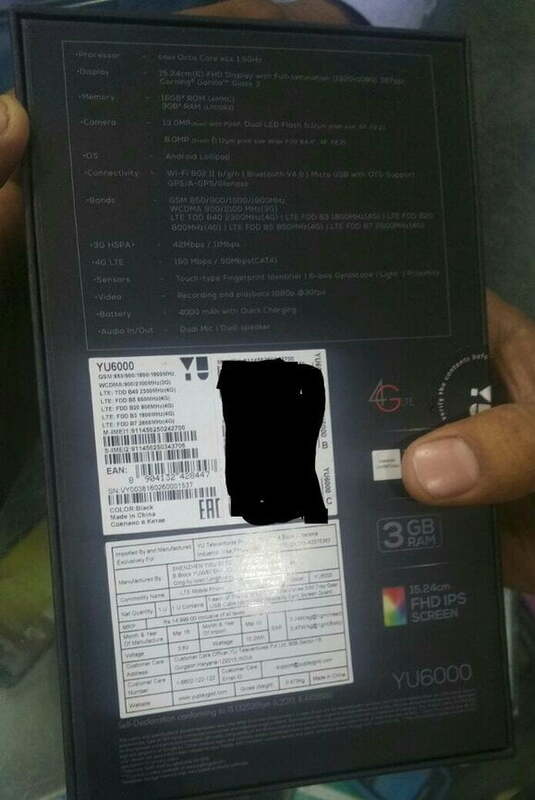 The leaked images of the Yu Yureka Note retail box were shared by a Twitter user. Yu phones are simply headache… Worst build quality…. Internal memory is low and runs on android 5.1 which is old version of android.